Why I feel for Emily Seebohm. Emily Seebohm after the 100 Backstroke final. After a dynamite heat and a semi-final which was a touch slower, Emily Seebohm came into the final of the 100 backstroke yesterday morning in the box seat to take gold, but as we know in sport their are no certainties. 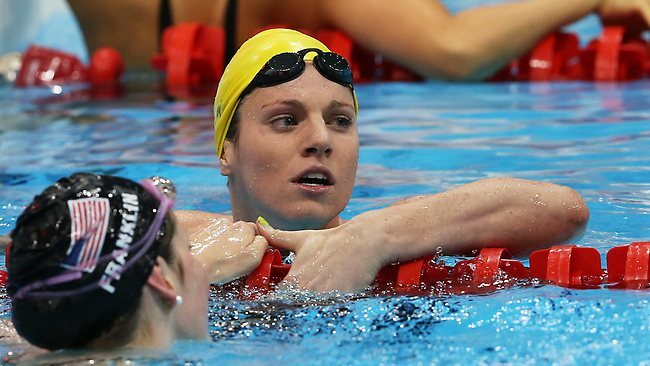 After finishing a “disappointing” second behind Missy Franklin of the United States, Seebohm was unable to contain her emotions when interviewed by Giaan Rooney after the race. Some have labelled her a “sook” for showing her raw emotions after coming agonisingly close the the holy grail of Swimming. This is fine if you’re an outsider with no knowledge of what goes on away from the tv cameras, in fact i’d be shocked if the majority of those never involved with the sport didn’t have that same thought. As a former swimmer myself, I wasn’t surprised at her reaction to the loss, because losing is never fun and the higher you climb in life the further you have to fall. Seebohm saying she was influenced by her own hype, and that she didn’t give herself enough time to get inside her own head as a result of a social media addiction (who doesn’t have one of those these days), may have had some influence over the race, but she knows, and has acknowledged that this was not the reason she lost. Fast forward to Seebohm speaking poolside. She was not only disappointed in herself, but worried that she had let down everyone around her – The Australian team, her parents, her coach, the Australian public, even getting to a point where she questioned if her parents would still love her. Again, sounds stupid, but that pressure is real. It’s real because when you swim, you put it there, even though it doesn’t exist to anyone else. The chain of events with Seebohm triggered something inside my head, from a perspective I had never thought of before. There was one race in my career where I felt that pressure, and it is a race I’ve written about countless times (I won’t give away too much here as it’s an issue that still burns 8 years later). It was February 2004 and I had one swim left to qualify for the 50 Breaststroke for Open Nationals. I’d qualified for three other events, so this wasn’t the be all and end all race, but it was the event that I always thought was going to be the first one I’d qualify for. The qualifying time for the event was 48.10 , a time that I had only got within a second of so I knew it was going to take something special, and that’s exactly what the build up to the event was, but not for reasons I care to remember. Earlier that week one of my Grandparents had passed away, so on top of trying to deal with the grieving process, I needed to get my head right for what I had worked so hard to achieve for the last three years. The race came and went and I swam 48.11 , sure it was a personal best but .01 of a second is an immeasurable amount of time and the list of things I could have done to get that time down is fairly long. After the race (in which I finished third, winning my first ever State Open medal in the process) I felt as if I was functioning outside my own body. I was numb, I was on the verge of tears and much like Emily Seebohm yesterday, I thought I’d failed a lot of people. When your parents decide they are going to drive you to the pool before the sun comes up and pick you up after it has gone down so that you can chase your dream, there aren’t many opportunities where you can say “here’s the reward”. That day was one of them. Given everything that had happened in the week previous I knew that if things went right that would be a small bit of relief, and when things went horribly wrong by the smallest of margins it made the situation a lot worse. The strange thing is that it didn’t. Everybody around me knew how tough the week had been and how badly I wanted to succeed. People were disappointed for me and not disappointed in me and that’s how we should feel for Seebohm. It makes no difference how she releases what she is feeling, we should support all of our athletes through thick and thin, something that has been lacking at this Olympics. Whether it’s an Olympic Gold Medal or qualifying in a race you so desperately want, missing out hurts, but it’s made better knowing that those around you will never judge you on that one performance. This entry was posted in Published on xavierplayer.com, Written. Bookmark the permalink. ← Olympics on the cheap.